Intelligent, secure business scanner with built-in networking and smart features for fast, high-volume scanning and circulation. The secure and intelligent DS-780N is a compact network scanner that speeds up workflows by enabling users to rapidly scan and share documents over a network. 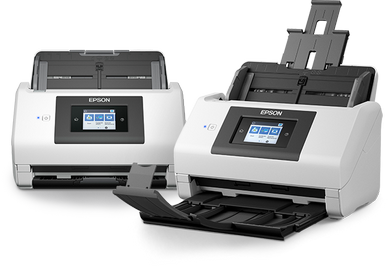 The high capacity 100-sheet ADF and fast scanning speed of 45ppm/90ipm in colour at 300dpi enable instant sharing and storing of scanned files. The DS-780N helps you gain control over critical information, improve your workflows and increase operational and process efficiency. Offering true network capability at multiple location points, the DS-780N is designed specifically for busy workgroups who need to scan and share documents effectively. Utilising the Authentication Edition module for Document Capture Pro Server, IT administrators can manage a variety of tasks centrally, from scan job profiles to user access rights. Those tasks can then be made accessible through the device’s touch screen panel in a number of ways including User ID and password, LDAP Active Directory, ID Card log in and pin code, ensuring the right jobs are made available to the right users. An interactive touchscreen control panel makes the DS-780N simple to use without training, and allows the right jobs to be made ready and available to the right users instantly and clearly. A control panel lock ensures jobs cannot be changed locally. Easily adjust images while scanning, using Epson’s image enhancement software with de-skew and auto rotate functions. Advanced features such as barcode recognition and Zonal OCR allow quick document separation and easy file naming. Intelligent features such as the Active Separation Roller System help prevent time-wasting document double-feeds. Every piece of paper will be scanned accurately and captured at the highest quality, thanks to the scanner's onboard sensors or facility to manually input paper lengths. The active feeding system starts with an innovative paper tray that lets pages be scanned more easily. By reducing the friction between the tray and the page to be scanned, it enables media to pass through the device more easily while minimising feed errors. Double Feed Detection Skip means difficult media – such as envelopes or documents with Post-it notes – can be scanned without risk at the touch of a button.